Signatories remind invited speakers of Israel’s direct attacks on Palestinians’ right to education and complicity of sponsoring academic institutions in Israel’s human rights violations. A group of Palestinian, Israeli, and international scientists and academics has called on colleagues to cancel their participation in a forthcoming conference in Israel, to show their solidarity with Palestinians living under occupation. The Federation of European Biochemical Societies (FEBS), has scheduled its 2017 Congress for 10-14 September. But the venue - the International Convention Centre in Jerusalem - has made it a target for the Palestinian-led campaign for the academic boycott of Israel. The letter, which has been signed by 89 scientists and academics, including Sir Iain Chalmers (UK), Professor Claudine Chaouiya (Portugal), Professor Ivar Ekeland (France), Prof. Malcolm H Levitt FRS FRSC (UK) and Professor Steven Rose (UK), draws its recipients’ attention to "Israel’s direct attacks on Palestinians’ right to education, including the bombing of schools and universities, and the obstruction of access to educational sites." The letter has been sent to all speakers at the Conference. Another factor supporting the boycott call is the unequal access of Palestinians to healthcare. One of the themes of the FEBS Congress is the biochemistry of cancer, which as the letter points out is tragically ironic. "The five-year survival rate for breast cancer is as low as 30% in Gaza, which Israel has besieged for the past ten years, as compared to 86% in Israel. In 2016, only 44% of Gaza patients who requested access to Israeli hospitals were admitted ; more than half of those refused entry were cancer patients." The letter goes on to list Israeli restrictions preventing students from Gaza attending universities in the West Bank ; the system of Israeli checkpoints in the occupied West Bank which causes daily obstacles for Palestinians trying to attend school or university ; and the "institutionalised discrimination" experienced by Palestinian students within the state of Israel. 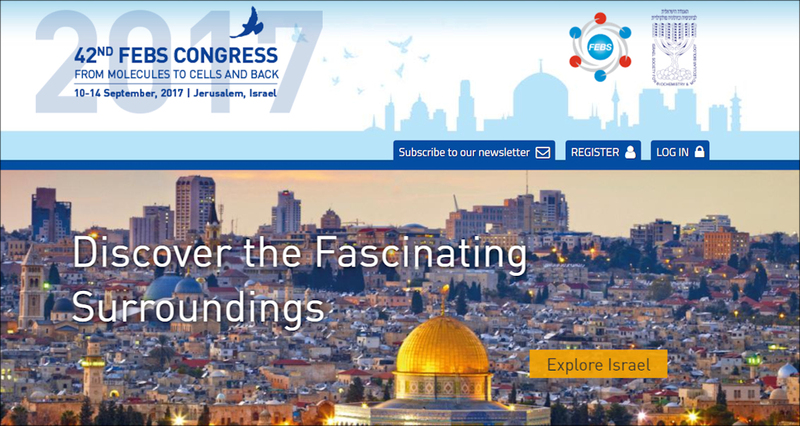 The FEBS Congress is sponsored by Israeli academic institutions which are accused of being "deeply complicit in Israel’s human rights violations". Tel Aviv University and Technion, for instance, have developed weapon systems and military doctrines employed in committing what Amnesty International and Human Rights Watch have condemned as war crimes, while the Hebrew University’s Mount Scopus campus is partially built on illegally confiscated Palestinian land in occupied East Jerusalem. Professor Jonathan Rosenhead, Chair of BRICUP, said : "Israel relies on international academic events like the FEBS congress to make it seem like a normal country. World public opinion begs to differ – Israel’s 50-year violation of international and human rights law puts it in a class of its own. Scientists can play a key part in driving this lesson home”. The academic boycott of Israel is inspired by the similar boycott of apartheid South Africa, which was called for in 1965 by 496 academics from 34 universities in the United Kingdom. The boycott of Israel targets institutions rather than individuals and has grown steadily in strength since it was launched in 2005. In 2013, as the letter points out, Stephen Hawking heeded appeals by Palestinian scientists and cancelled his scheduled participation in an Israeli conference. The writers are asking potential participants in the FEBS Congress to follow his example. The letter concludes : "Refraining from lending one’s name to a system of injustice is not a charitable act ; it is a basic moral duty".